Journal Reference: Sedlacek III A, P Buseck, K Adachi, T Onasch, S Springston, and L Kleinman. 2018. "Formation and evolution of tar balls from northwestern US wildfires." Atmospheric Chemistry and Physics, 18(15), 10.5194/acp-18-11289-2018. (a) Mass ratio of TB to soot (black squares) as a function of plume age. (b) Mass fractions of TBs (red circles) in the smoke plume as a function of plume age. 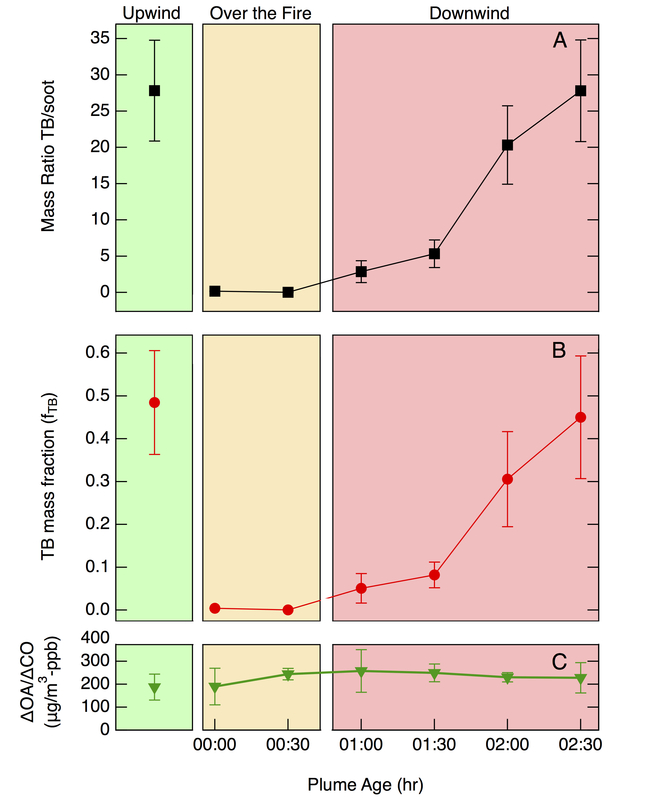 As the wildfire plume ages, the TB mass fractions increase from 0 to 0.45 of the total aerosol mass loading. Upwind of the fire, the background TB mass fraction is estimated to be about ∼50% (green shaded region). (c) Ratio of organic aerosol to CO –- to correct for dilution –- for background (upwind) and as a function of plume age. Single-scattering albedo (SSA) derived assuming four refractive indices for TBs (SSAAlexander – red, upward-pointing triangles, 1.67 − 0.27i;SSAHoffer – black, right-facing triangles, 1.84 − 0.21i; SSAHand – blue, left-facing triangles, 1.56 − 0.02i; and SSAChakrabarty – purple, downward-pointing triangles, 1.80 − 0.007i). Observed SSA –green squares. Wildfires are major sources of organic and black carbon aerosol particles and tar balls -- a type of brown carbonaceous particle apparently unique to biomass burning -- are under-recognized constituents of wildfire emissions. To help quantify the contribution of biomass burning (BB) to aerosol radiative forcing, the U.S. Department of Energy’s Atmospheric Radiation Measurement (ARM) user facility carried out an aircraft-based field campaign (BBOP: Biomass Burning Observation Project) that targeted the near-field evolution (< 5 h) of BB aerosol particles. Here we focus on the production of atmospheric tar balls (TBs) from wildfires in the northwestern United States. This work describes the first atmospheric observations of the formation and evolution of tar balls from forest fires. Tar ball mass fractions increased from < 1% near the fire to 31–45% downwind, with little change in TB diameter. 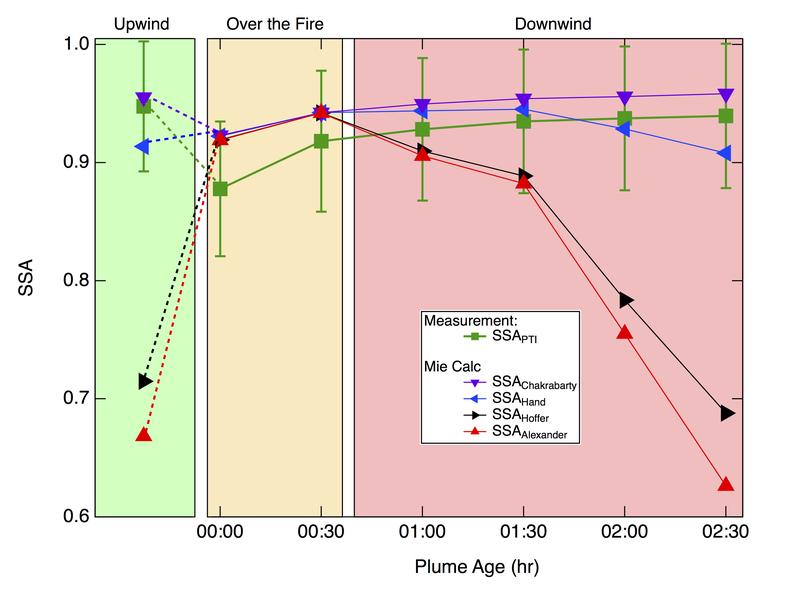 Single-scattering albedo (SSA) determined from scattering and absorption measurements increased slightly with downwind distance. Mie calculations are consistent with weak light absorbance by TBs (i.e., m similar to the literature values 1.56−0.02i or 1.80−0.007i). Aerosol particles were collected on transmission electron microscopy (TEM) grids during aircraft transects at various downwind distances from the Colockum Tarps wildland fire. 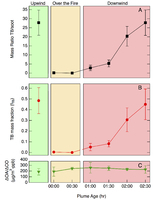 By uniquely combining transmission electron microscopy (TEM) analysis with single-particle soot photometer (SP2) and aerosol mass spectrometer (AMS) data, we also found that in some plumes up to 31-45% of wildfire aerosol mass was accounted for by TBs. Single-scattering albedo (SSA) determined from scattering and absorption measurements increased slightly with downwind distance. Based on aerosol mass loadings and SSA derived from BBOP measurements, Mie calculations are consistent with weak light absorbance by TBs (i.e., m similar to the literature values 1.56−0.02i or 1.80−0.007i) but not consistent with absorption one order of magnitude stronger observed in different settings. Given the observed evolution of TBs, it is recommended that these particles be labeled as processed primary particles, thereby distinguishing TB formation–evolution from secondary organic aerosols. The BBOP campaign was the first time the TB mass fraction has been estimated. While it has been known that TBs are formed in fires around the globe and that the number concentration of TBs is often large, the mass contribution found from BBOP field measurements shows the need to accurately represent these light absorbing particles in aerosol and climate models.